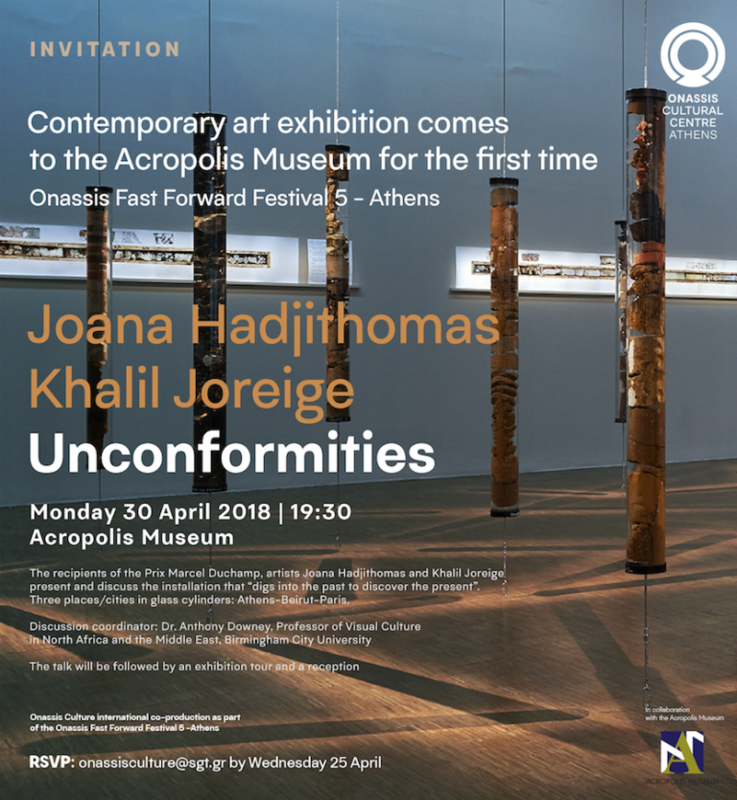 It is for the third time that OCC invites the distinguished French-Lebanese pair; this time their project “Unconformities” at the Acropolis Museum, following its initial presentation at Centre Pompidou in Paris for which they were awarded the Prix Marcel Duchamp (2017). “Unconformities” is a mixed media installation, an amalgam of soil and rocks, stories and secrets of three historic cities. Athens, Beirut, Paris: three cities that haunt the two artists, Joana Hadjithomas (of Greek origin) and Khalil Joreige. Through Unconformities, we descend to the substrata of these three cities: to what we can learn from the Athenian shale, the alluvial deposits of Kifissos, and the rich archaeological strata in Monastiraki, Kerameikos and Elaionas, from demolition materials in Martyrs’ Square in Beirut and the parafluvial Seine deposits in the wider Louvre area. “Digging into the past we discover the present,” say the two artists who have for four years been collaborating with geologists, archaeologists and historians to collect, reconstitute and exhibit findings of geological drilling. Imagine then a contemporary art exhibition made up of natural geological materials, soil and ruins from the substratum of these three cities, placed cylinders called “borehole cores”. Hadjithomas and Joreige turn their eye to tectonic discontinuities and most of all to stratigraphic unconformities. This is where, in the wealth of information available in the substrata, a stratigraphic gap intervenes, a secret past that has left no trace but plenty of room for imagination. The two artists construct transcendental narratives about these uncharted eras, vacillating, as they often do, between documentary and fiction. The latent and tacit concepts, i.e. what can be derived from the context, are central to their work. A different, nonlinear approach to history is made possible: history as incident and action, a palimpsest of ages and cultures. The Acropolis Museum welcomes this award winning exhibition (Prix Marcel Duchamp, 2017), presented in Centre Pompidou last year, which is coproduced by the OCC. “An archaeology of the heart in the heart of an ever troubled present,” was a comment on Unconformities, this profound museum of Athens, Beirut and Paris, which encompasses both prehistory and our own geological age, what we call Anthropocene, the era in during which our species has proved to be ten times as catastrophic as all natural phenomena combined. In Unconformities, the city reveals itself in terms of place and time. Veins of clay or copper come to light and become tokens of a different, more moral, poetic and ecopolitical geology, archaeology and eventual self-discovery. Beneath our feet, hidden in the gut of the city, lies a subterranean world full of traces of natural phenomena, ancient settlements, contemporary constructions and deconstructions, impressive foundations and devastating wars.